There’s nothing quite like the American Museum of Natural History. Every cavernous room offers up treasures: dinosaur bones, gleaming gems, enormous plaster centipedes and taxidermied animals, posed in sunny dioramas of their worldly habitats. A visitor could walk the halls for years and never notice all of the details; few know that even more secrets hide behind closed doors. If you walk down the hall next to the Hayden Planetarium, slip inside an industrial elevator and head to the fifth floor, you’ll find the center of it all: The Preparator’s workshop, where the museum’s science springs to life. Can’t find an intact T. rex skeleton? Need a fluorescent fish tornado on the quick? It’s their job to make plaster casts and other models for the museum, and their workshop is proof of their talent. Enormous sharks, gulping fish, multi-colored Christmas lights, gigantic drawings of dragonfly wings, a clock that doesn’t work… It reminded me of an I Spy book you could walk through, touching each object as you went. I was there to meet an artist who’s seen it all: Kurt Freyer. He led me to a table amongst the madness, serving as an impromptu lunch room. Pictures of the same space from the 1800s were pinned to the wall above us, when early preparators had been working on the first round of taxidermies. Some kind of large cat model perches on the wall beside it, like a relic from those early days. Freyer is young and radiates chill, with blonde scruff hidden under a multi-colored baseball cap. I peppered him with questions, which he answered slowly and thoughtfully, but when I suggested he give a tour he leapt to his feet. He seemed to be a person more interested in doing than philosophizing. Growing up in New York, he’d visited the museum as a kid, and dreamed of working there. Freyer studied sculpture, and as soon as there was an opening at the museum he took it, first as an intern, and then he snagged a position in maintenance before joining the preparators. The job in maintenance helped Freyer understand the history of the museum and the work of artists before him. “In a lot of the exhibits, what you see from the outside is not the whole story,” Freyer said. He described entering a rarely-used room off of the Hall of African Mammals and finding a scene from some long-gone employee: an ancient chair with a 1950s pull-tab beer can beside it. Also hidden are little notes from preparators to loved ones, newspaper clippings and scrawled sketches. “That secret, behind-the-scenes area was always very fun,” Freyer said. “From the outside, the dioramas look pristine, but when you look behind them there are fingerprints everywhere. You see the hand of the makers.” Some aspects struck him as funny: A perfect wildebeest from the front, for example, might not be finished in the back. Working in maintenance also helped Freyer understand how to make his creations last longer, yet match the old pieces stylistically, thanks in part to new materials. While early generations of preparators used plaster, metal and taxidermy, their modern counterparts are armed with over 20 types of plastics and resins that can harden into a wider variety of shapes, colors and textures than early workers could possibly have imagined. Some things are still low-tech, however. In the recent “Cuba!” exhibit, thousands of pretend tobacco leaves were made from brown paper, beaten and colored to seem weathered. Clay still forms the base of most early stage creations, and foam forms the core. Though Freyer trained as a creative artist, creating pieces for the museum requires a very different kind of discipline: Working with scientists to create the perfect T. rex, a clump of algae or a Cuban anole lizard. Yet Freyer has excelled at exactly the type of crazy and varied skills that working in such a crazy and varied environment requires. For instance, in the “Cuba!” exhibit, Freyer was one of the leading artists on a quest to create “water” from clear resin. By experimenting, they learned the exact combination that would hold its shape, rippling and splashing just like water would. “Kurt is a very talented sculptor and is generally a good builder and tinkerer,” Freyer’s boss, Dean Markosian said, via email. 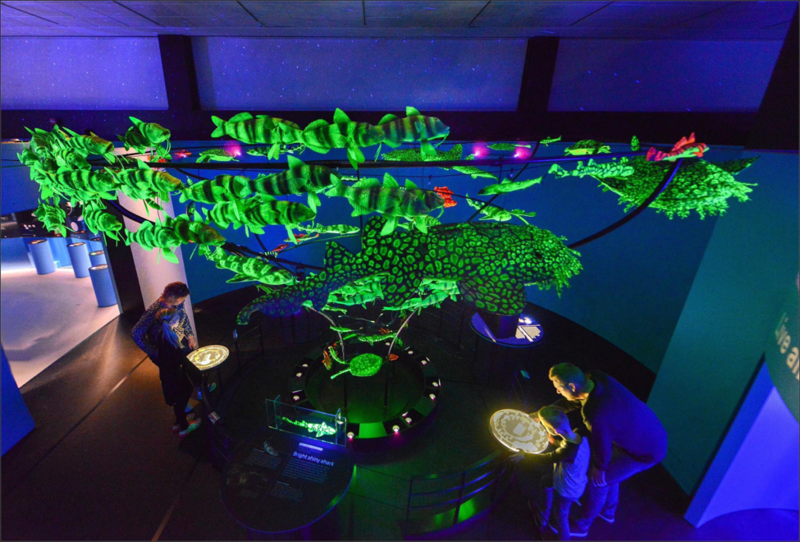 Markosian mentioned how those skills came in handy creating the glowing mushrooms in the Creatures of Light exhibit and noted that he’s crafted most of the museum’s sharks. Despite these accomplishments, Freyer is modest. “I had some art career intentions, but I mostly just do it on my own,” Freyer said, looking down. He’s quick to note the talents of the many other artists he works with, and I get the sense that this is a funny job, where their work is essential to the museum, but individuals rarely see the spotlight. Inside his office, though, Freyer reserves some space to try out some art on his own. Orchids hang on the windowsill, luxuriating in plastic bags, his ongoing art experiments. A small fish tank gurgles in the corner, packed with lustrous clumps of sea grass and an aquatic moss. Tetra, catfish and shrimp zip through the fronds. “I’m a plant person,” Freyer shrugged. His plant experiments continue at home, with more orchids and more moss, which he allows to grow wild and crazy, away from human intervention. His prize plant, a staghorn fern, takes up a whole window. Other than plants, Freyer likes to dabble in the abstract, like wood carving and weaving. “I like things that are natural but man-made in a way,” he said. Freyer and the team had been hard at work on an upcoming T. rex show, and before I left he showed me some heads they’d started making, with enormous teeth made in silicon molds and a plastic tongue about six inches long. I knew I had to leave, but I didn’t want to. We shook hands, and then I walked to the elevator, past an enormous wooden box labeled “SLOTH”. It had been touring the world for a decade, and was heading to its final resting place in storage at the Brooklyn Navy Yard. Back out in the museum, hundreds milled through the halls, and I wondered how many of the visitors had an inkling of the mysteries just beyond the walls.